If we were to see several consecutive months of supply getting smaller, it would point to an improving housing market," said Celia Chen, senior director at Moody's Analytics. "Even if it is investors buying them, they are renting them out in hopes that prices in the next several years will rise. 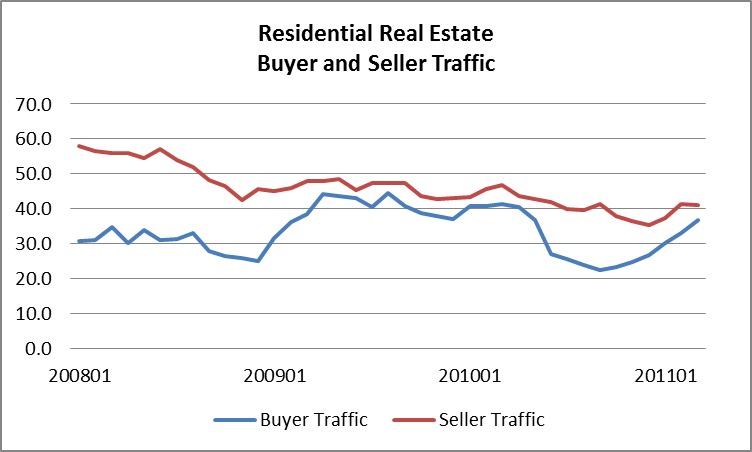 According to the latest Realtors Confidence Index, the gap between the indices of Prospective Home Buyer Traffic and Prospective Home Seller Traffic has narrowed, with an increase in Prospective Buyer Traffic. A continuation of the narrowing of the gap between buyer and seller interest would be favorable to the strengthening of real estate markets nationwide. 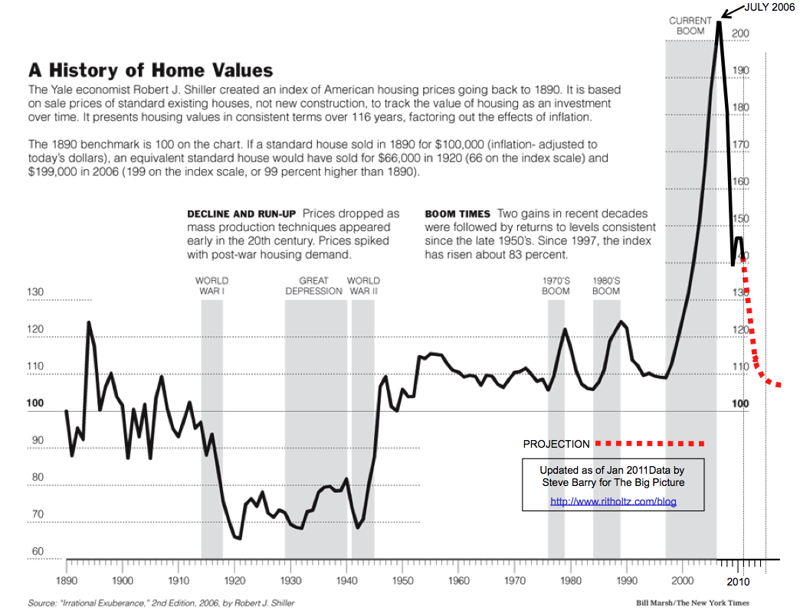 In many cases, and in recent years, market prices have already declined substantially. The size of the shadow inventory, mortgages, 30 days overdue or in forecolsure, suggests that problems may not be resolved for two or three years. However, the shadow inventory is declining in size and we may be near the end of continued price declines in many markets. “There is very little, if any, good news about housing. Prices continue to weaken, trends in sales and construction are disappointing. says David M. Blitzer, Chairman of the Index Committee at S&P Indices. Ten of the 11 MSAs that recorded index lows in January fell further in February. The enormous supply overhang of existing homes (particularly factoring in all those in foreclosure or soon to be) promises to keep pressure on prices for some time,” said Joshua Shapiro, chief U.S. economist at MFR Inc. “From a longer-term perspective, it is important to keep in mind that in the seven years leading up to the peak in July 2006, the nonseasonally adjusted national 20 city home price index jumped by 155% (126 index points)… So far, this index has dropped by 32% (66 index points) in the 55 months since the peak. I could fill the page with pessimists, hardly a positive thought out there today. I think the most positive take away is that at least this is an orderly retreat, rather than the kind of screeching declines we have seen. Market Composite Index: (loan application volume) a measure of mortgage loan application volume, decreased 6.7 percent on a seasonally adjusted basis from one week earlier. On an unadjusted basis, the Index decreased 6.3 percent compared with the previous week. Refinance Index: decreased 7.7 percent to its lowest level since February 11, 2011. Purchase Index: The seasonally adjusted Purchase Index decreased 4.7 percent from one week earlier. Refinance Share of Mortgage Activity: decreased to 60.3 percent of total applications from 61.2 percent the previous week. This is the lowest refinance share since May 7, 2010. Arm Share: decreased to 5.9 percent from 6.1 percent of total applications from the previous week. We expect declines in refinance activity will be the primary factor impacting our originations forecast for the full year 2011, with total mortgage originations decreasing to $1 trillion in 2011. However, we have increased our forecast for refinance originations given the dip in rates associated with global uncertainties. Increases in purchase originations will not be enough to offset the drop in refinances over the year, as mortgage rates reach 5.5 percent by the end of 2011. We expect that the refinance share of originations will drop from 70 percent in 2010 to 41 percent in 2011, and then 24 percent in 2012 as rates climb above the 6 percent mark. We project that originations will be below $1 trillion in 2012.
averaged 4.91 percent with an average 0.6 point for the week ending April 14, 2011, up from last week when it averaged 4.87 percent. Last year at this time, the 30-year FRM averaged 5.07 percent. The 15-year fixed-rate mortgage: averaged 4.13 percent with an average 0.7 point, up from last week when it averaged 4.10 percent. A year ago at this time, the 15-year FRM averaged 4.40 percent. Five-year indexed hybrid adjustable-rate mortgages ARMs: averaged 3.78 percent this week, with an average 0.6 point, up from last week when it averaged 3.72 percent. A year ago, the 5-year ARM averaged 4.08 percent. One-year Treasury-indexed ARMs: averaged 3.25 percent this week with an average 0.6 point, up from last week when it averaged 3.22 percent. At this time last year, the 1-year ARM averaged 4.13 percent. Mortgage rates edged up following a light week of economic data releases. Although rates on 30-year fixed mortgages have risen four weeks in a row, they have remained below 5 percent for eight straight weeks now, helping to maintain affordability in the housing market. Meanwhile,consumer purchases of retail goods rose for the ninth consecutive month in March, suggesting families have an increasing capacity to spend, which bodes well for the economic recovery. wiki: South Park is a small neighborhood South of Market in San Francisco. It centers on the small, oval-shaped park of the same name, and South Park Street, which encircles the park. The area is bounded by Second, Third, Bryant, and Brannan streets. mansions and townhouses around an oval grassy park. Built as an exclusive community it featured the first paved sidewalks in San Francisco. A windmill in the center of the park pumped water for the houses. Wealthy residents moved to Nob Hill in the late 19th century and the city took over the park in 1897. After the '06 earthquake most of the homes in the area were destroyed and South Park deeclined. 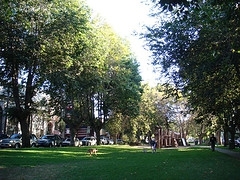 The oval park remained unchanged and is still the centerpiece of the neighborhood. This quaint part of town was rediscovered when the area was populated by the dot-com boom of the late 1990s, South Park is home to many small internet start ups. In fact, it was twitters first office. San Francisco’s Board of Supervisors just voted to create of a payroll tax exemption zone. The tax exemption zone envelopes the blighted mid-Market and Tenderloin areas. The city is redevelping all of Market st. as part of the Better MArket Street Project and wants to see a beautiful revamped boulevard stretching from the Embarcadero Ferry Buidling, past the new Transbay project up to mid market with this tax break to keep startups that find success here, all the way up to the new Octavia projects in Hayes Valley. Twitter, has said that it plans to move into a building within the zone if the payroll tax exemption legislation is passed. Shorenstein has recently bought the building Twitter is thinking of moving to and now that the tax exemption is passed, it seems likely we will keep them from moving to the peninsula. Besides if Twitter moved we wouldnt have had those taxes anyway.